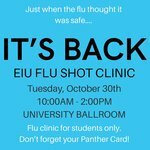 Health Services, "Second Flu Shot Clinic" (2018). The Flu: Press and Publicity. 10.